Spanish troubadour in the fourteenth and fifteenth centuries; born at Baena, Cordova. He was "escribano escribiente" (notarial secretary) at the court of John II. Under the title "Cancionero del Judino Juan Alfonso de Baena," he collected the productions of the poetical coterie of the courts of John I., Henry III., and more particularly of John II. of Castile: "those of the friars and monks, the masters of theology, the knights and the squires, and various others." These different poems—which, in their entirety, give a perfectly rounded picture of the "gaya sciencia," as the art of poesy was called—recorded the social life and doings of this circle, for the amusement of the king and his court. This "Cancionero," or song-book, is the oldest Castilian and the only court song-book of the country, and it contains the poems (written mostly for special occasions) of fifty-five authors, all belonging to the Sevillan school of poetry, as distinguished from the Valencian school. Among these poets are a number of Maranos—Pero Ferrus, one of the oldest but also the most decadent of them all; Garci Fernandez de Jerena, and others—who wrote malicious satirical songs about their former coreligionists. De Baena, "this Judino" as he was called, was well versed in the poetry of his country, particularly so in satire and poetical letters. His "Cancionero" contains "requestas" and "decires" (apothegms) by him. The "Cancionero de Baena" was first published at Madrid in 1851 by Gayangos and Pidal, with an excellent introduction by the same; and then by Francisque Michel, Leipsic, 1852. As a Marano De Baena met with much hostility. 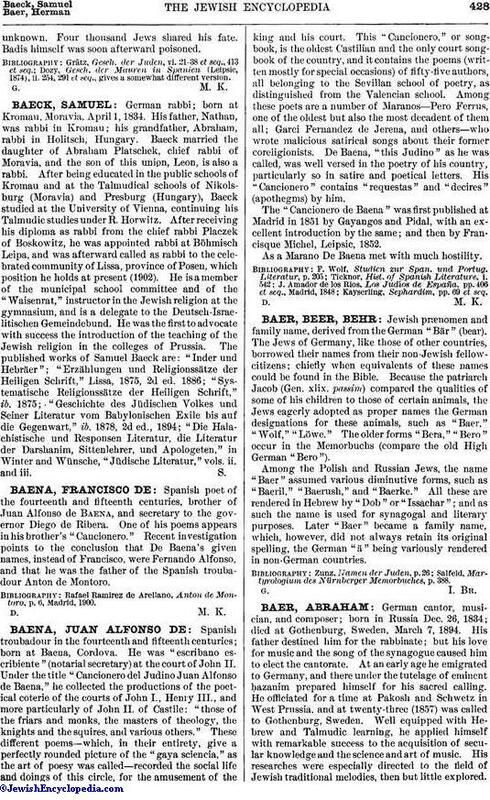 Kayserling, Sephardim, pp. 69 et seq.